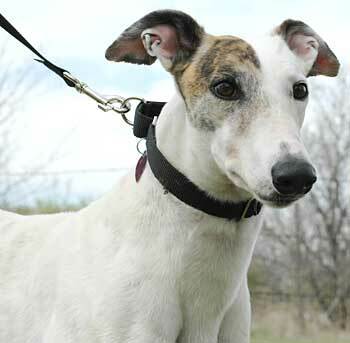 Meyer, aka Kiowa Mysticmyer, is a handsome white male with a brindle patch covering his right eye. Born on April 16, 2002 to sire Flying Penske and dam Kiowa Mysticrule, this soon-to-be 5 year old raced primarily at the Southland and Wheeling Downs tracks before retiring from the Dairyland track in Wisconsin. 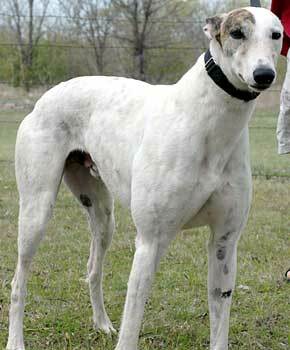 Meyer's last race was on July 12, 2005 and somehow he made his way to Texas, ending up as a stray with Polo in the Ft. Worth Animal Shelter. Because of Meyer's tattoos we are able to uncover parts of his past, but the focus is now on Meyer's future and his search for a forever home. Meyer is not cat tolerant. 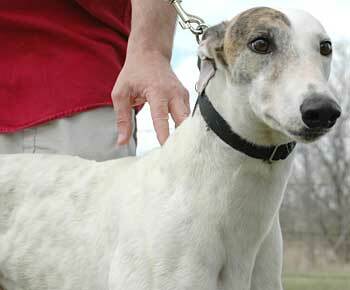 Meyer is a fun-loving boy with a cute-as-a-button personality! He transitions easily from scampering around the backyard with his foster siblings to lounging on the nearest dog bed in the house. He never makes a peep at night in his foster parents' room nor in his crate...what an easy-going boy! He's a very sensitive young man, so housebreaking him was very easy. He just wants to please!